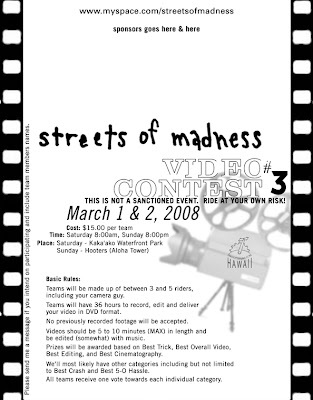 I’ve been hearing that a few people have been talking about the Streets Of Madness contest. Well we have set aside the dates of March 1st and 2nd for the contest. The basic rules will remain the same although the 10min. time limit will be strictly enforced. I got confirmation from Hooters that we have the back section on Sunday night. I will announce times and particulars as we get a little bit closer. Go ahead and get your teams (3-5 riders including photog) together.